This week I've been making some real progress on my second incarnation as a hobby publisher of small print run games. I've booked an appointment at the bank to set up a business account and I've been getting quotes for printing Zombology too. When doing a small print run, just as with a large print run, there are three variables you need to balance against each other: total cost, cost per game and quality. The three are tightly linked: better quality increases both total cost and cost per game; a bigger print run increases total cost but decreases cost per game due to economies of scale; reducing cost per game lets you increase quality or decrease total cost. Total cost: this plus some money for the overheads is my stake in the gamble of running a company. It's coming out of our family's savings, so I don't want this to be too high or I'd be being very irresponsible. First time round there was just The Wife and I in full time employment, and we had some money from an unexpected windfall to invest, but it's different once you've got a kid - priorities change. So low total cost is important to me. 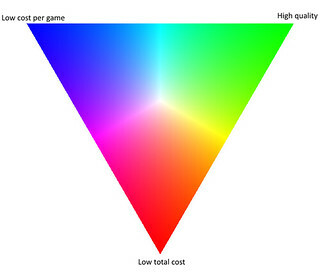 Cost per game: in addition to the manufacturing cost I need to pay for: a website, advertising, PayPal fees, convention attendance and many other things. I've previously stated that I want to keep cost per game around 50% of retail so that the sales will cover the other things and hopefully make a small profit. I'm not going to take a salary (again!) but I want the company to at least pay for itself, and if I make a profit I'll have more money to invest in potential future games. Keeping the game price low is also important for boosting sales, especially in other countries. I'm aiming to make the game retail at around £10, which is in the same ballpark as 6 Nimmt! and other similar games in the UK. But that's $15.50 at today's exchange rate in America or 13,80€ in Europe both or which are quite high for that type of game, plus there's shipping on top to make it more expensive still for people outside the UK. Clearly with a small print run I'll be selling directly - there's not enough margin for shops or distributors to take a cut. Quality: I'm aiming for a similar quality to Border Reivers, the first game I self-published back in my Reiver Games days. The cards were on decent card stock and professionally laminated to protect the ink, the box was a tray and lid one with wrap-around artwork, that looked similar to, if not quite up to spec of, a professional game. With a small print run you don't have enough copies to amortise the cost of an artist, so I'm doing it myself (an obvious weakness in the quality). The cards will be cut out by hand but at least the corners will be rounded, so again, it looks of reasonable quality. 50 copies is not going to break even once the overheads are accounted for, they'll almost certainly come to more than £108. 100 copies is much better, but at 150 it gets interesting. I'm willing to invest/risk £1,000 in this venture (plus a bot-load of my time for free! ), and 150 copies falls well within that. So that's a tick (check for Americans). £4.44 is less than half of £10, but also actually less than half of £9. £9 retail would reduce the cost for Americans by $1.55 and Europeans by 1,38€. It would also shave £150 off my potential profits, but £684 is still plenty for the overheads I'm expecting and should leave some money behind so that I've got more money to invest in another game if I want to in the future. Tick! In 2004 I was a hobby games designer. In 2006 I became a hobby board game publisher. In 2008 I became a (bad!) professional board game publisher. In 2011 I was a failed entrepreneur and really didn't feel like designing games any more. When I had the idea of Codename: Vacuum at the end of 2012 I started my second incarnation as a hobby games designer. And that's where I stayed for nearly three years. My Reiver Games failure hung over me, so I've been in no rush to get back into publishing. I know just how much hard work goes into hobby publishing (hand-made Border Reivers-stylee) and how many copies you've got to make and sell to be successful in the professional arena. Also, my confidence took a bad knock: games I thought would sell really well didn't sell and the game I had designed personally was the weakest of the games I published as Reiver Games. So for the last two and a half years I've been a hobby games designer and nothing more. That's been fun, and I've now got a great support network in the form of Newcastle Playtest. All this time my games have been slowly developing. I've been keen not to rush into publishing again with a sub-par game. This year's goal of hobby publishing a game is finally starting to take shape and once again I'm starting to feel like a publisher (albeit a hobby self-publisher). Rather than designing the games or doing the basic graphic design required for a prototype, I'm starting to think in terms of production. 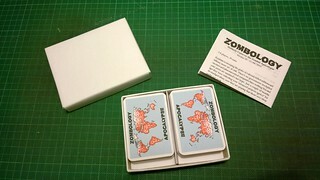 This weekend I've made a new prototype of Zombology, trialing a net for a wrap around box label (currently just a white sheet - no art at all). I'm also working out how best to arrange things on sheets of paper to minimise printing costs. I've got a quality bar that I want to stick to (as good as Border Reivers), and depending on cost I'm going to have to choose a print-run size based on where the economies of scale make it affordable. All this has happened before, and all this will happen again!